The solar corona has a problem: it’s weirdly hot! A new study explores how magnetic waves might solve the mystery of the unusually hot corona by transporting energy to the outer atmosphere of the Sun. 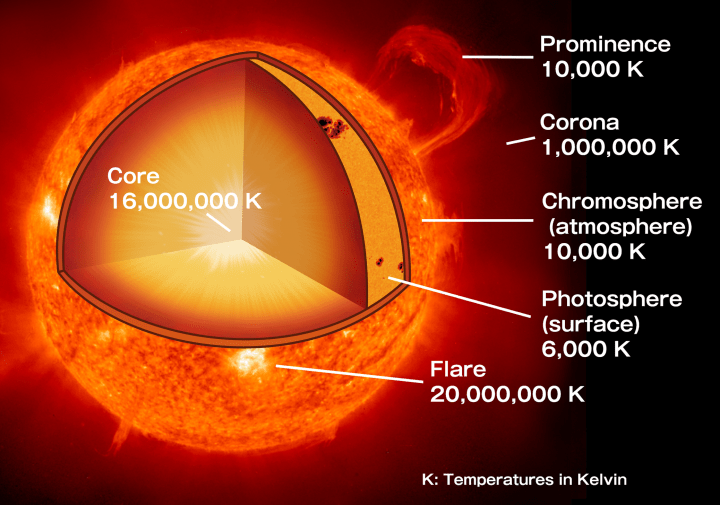 The corona, the outer layer of the Sun’s atmosphere, has typical temperatures of 1–3 million K — significantly hotter than the cool 5,800 K of the photosphere, the surface of the Sun far below it. Since temperatures ordinarily drop the further you get from the heat source (in this case, the Sun’s atom-fusing center), this so-called “coronal heating problem” poses a definite puzzle. As is the case for many astronomical mysteries, the answer may have something to do with magnetic fields. Alfvén waves, magnetohydrodynamic waves that travel through magnetized plasma, could potentially carry energy from the convective zone beneath the Sun’s photosphere up into the solar atmosphere. There, the Alfvén waves could turn into shock waves that dissipate their energy as heat, causing the increased temperature of the corona. Alfvén waves as a means of delivering heat to the corona makes for a nice picture, but there’s a lot of work to be done before we can be certain that this is the correct model. Observational evidence of Alfvén waves has thus far been limited to specific conditions — and the observations have not yet been enough to convince us that Alfvén waves can deliver enough energy to explain the corona’s temperature. Lucas Tarr, a scientist at the Naval Research Laboratory, argues that upcoming solar telescopes may make it easier to detect these waves — but first we need to know what to look for! 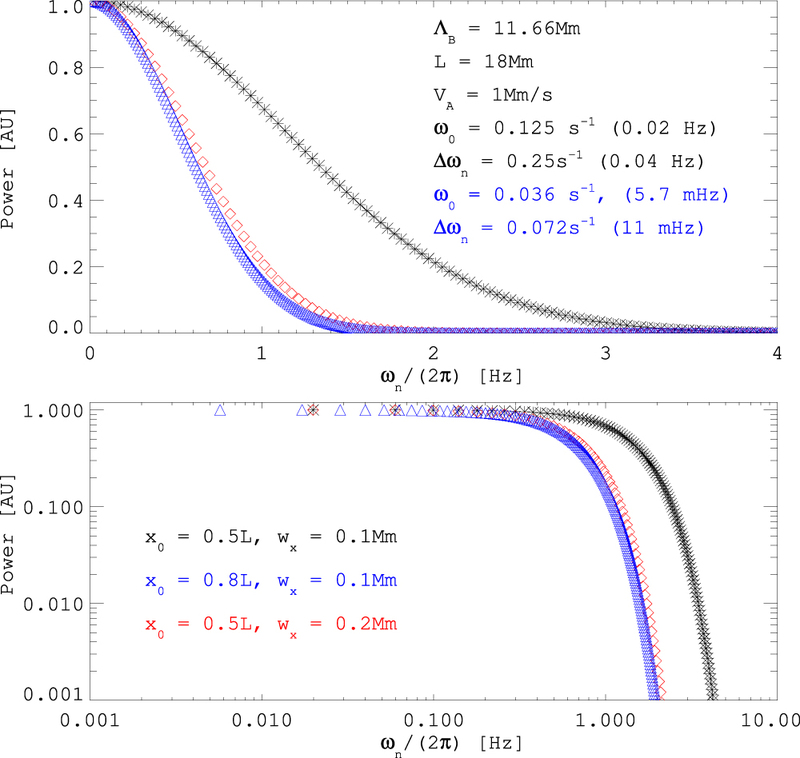 In a recent study, Tarr uses a simplified analytic model to show which frequencies of waves are likely to carry power when magnetic field lines in the corona are pertubed. Tarr modeled the effects of a minor perturbation — like a local magnetic reconnection event in the corona — on a coronal arcade, a common structure of magnetic field loops found in the corona. Tarr determined that such a disturbance would peak in power at a low frequency (maybe tens of millihertz, or oscillations on scales of minutes), but a substantial portion of the power is carried by waves of higher frequencies (0.5–4 Hz, or oscillations on scales of seconds). Tarr’s findings confirm that with the cadence and sensitivity of current instrumentation, we would not expect to be able to detect these Alfvén waves. The results do indicate, however, that high-cadence observations with future telescope technology — like the instrumentation at the upcoming Daniel K. Inouye Solar Telescope, which should be completed in 2018 — may have the ability to reveal the presence of these waves and confirm the model of Alfvén waves as the means by which the Sun achieves its mysteriously hot corona. See the full article for further references with links. The mission of the American Astronomical Society is to enhance and share humanity’s scientific understanding of the Universe. The Society, through its publications, disseminates and archives the results of astronomical research. The Society also communicates and explains our understanding of the universe to the public. The Society facilitates and strengthens the interactions among members through professional meetings and other means. The Society supports member divisions representing specialized research and astronomical interests. The Society represents the goals of its community of members to the nation and the world. The Society also works with other scientific and educational societies to promote the advancement of science. The Society, through its members, trains, mentors and supports the next generation of astronomers. The Society supports and promotes increased participation of historically underrepresented groups in astronomy.